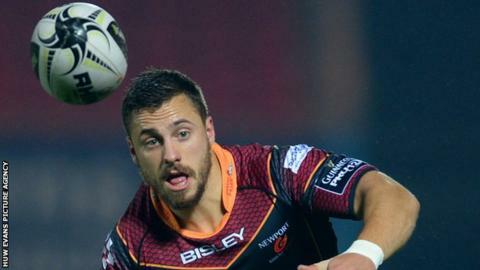 Newport Gwent Dragons fly-half Dorian Jones is expected to be out for several months with a chest muscle injury. The 23-year-old left the field during the first half of the Dragons' defeat by Ospreys on New Year's Day. "Dorian has had a pectoral injury, which looks quite serious," said Dragons director of rugby Lyn Jones. "It could be a few months, which is a blow to us because he's right on top of his game, starting to challenge for national honours behind Dan Biggar." Scrum-half Sarel Pretorius was also forced off at the Liberty Stadium with a recurrence of a calf injury. But the Dragons will welcome back Hallam Amos and Tyler Morgan later this month. The Wales internationals have not played since suffering shoulder injuries during the World Cup but at least one could be fit in time for the crucial European Challenge Cup ties at home to Castres on 15 January. "They are big-time players who can offer something different," added Dragons boss Jones. "There's a good chance one of them will be back [to face Castres], which one I'm not sure. "They've made really good progress and the medical department need to be congratulated for getting them back with such speed. "They've recovered very well and we expected both of them to be playing some part in the European competition shortly."